I was sitting in the office doing my desk work when I got a call from my dad, who works outdoors at a nearby theme park. “Go outside and look up,” he told me. The dutiful son (most times, anyway) that I am, that’s precisely what I did. Upon stepping outside and looking up, I spied a beautiful, large sun halo. 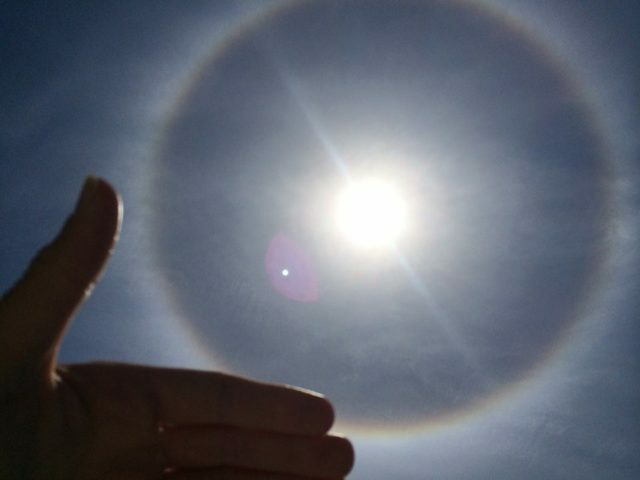 I snapped about 2 dozen photos of the sun halo with my smart phone and proceeded to head back inside so I could find out more about this incredible phenomenon. 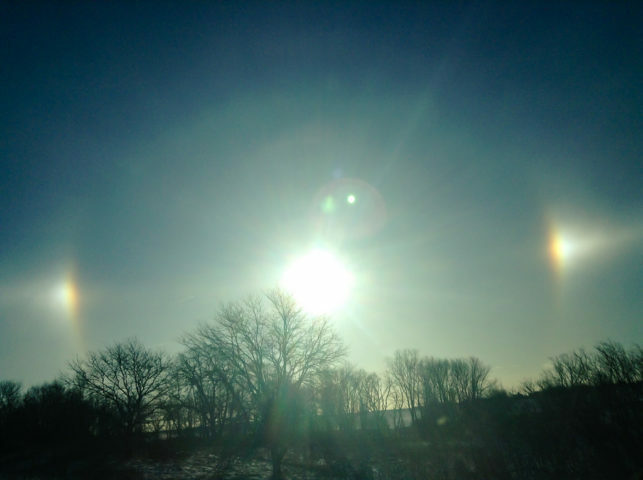 As a life-long weather bug, I had already known that the event was caused by ice crystals up in the sky – I’ve seen many sun dogs in my life, too, and they are similarly caused by ice crystals in the atmosphere. But, what I didn’t know right away was why this particular sun halo had occurred. In my memory, I had never seen one as a spectacular as this one. Apparently, my dad and I weren’t alone – just about all of Central Florida was calling in reports of the sun halo to local law enforcement authorities and news stations. The Weather Channel even ran a story about it. What Causes A Sun Halo To Form? As I touched on earlier, ice crystals in the atmosphere create the prism effect necessary to make a sun halo appear in the sky. But there’s much more to it than just that. These ice crystals are contained in cirrostratus clouds that are located from 3 to 6 miles, in the upper troposphere. The shape and orientation of these crystals affect the appearance of the halo. Reflection and refraction control the shape of the sun halo, and dispersion of light waves affect the colors you see. Sun halos are generally considered rare and are formed by hexagonal ice crystals refracting light in the sky — 22 degrees from the sun. This is also commonly called a 22 degree halo. The prism effect is such that the rainbow colors go from red on the inside to violet on the outside. Must read: 22 Degree Halos Explained… With Diagrams! Some might be inclined to think of sun halos as a type of rainbow. However, while they are both types of optical phenomena, they are different. Rainbows are caused by water droplets, whereas ice crystals create sun halos. What Shapes Can A Sun Halo Be? The term “halo” usually implies a ring, and circular halos around the sun (and moon) are common. However, there is another type of optical phenomenon that’s commonly classified as a sun halo, and that’s the light pillar, or sun pillar. 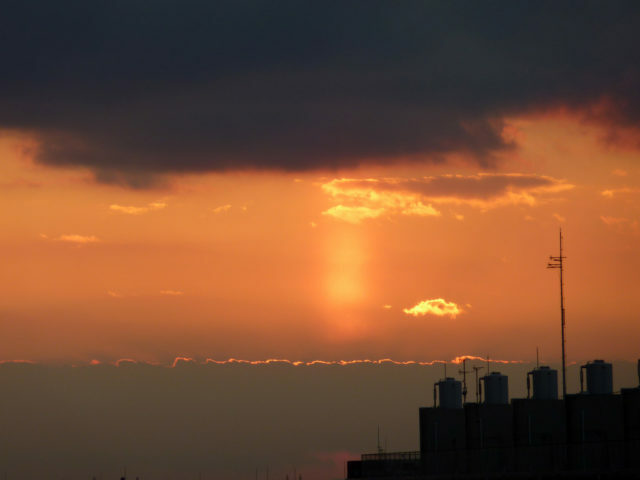 Sun pillars are caused by hexagonal-plate and column-shaped ice crystals, and they can only make a pillar appear when these crystals are within a certain orientation of the sun relative to the horizon. Plate ice crystals will cause a pillar when the sun is within 6 degrees above or below the horizon. Column ice crystals can create a sun pillar when the sun is as high as 20 degrees above the horizon. These types of ice crystals are generally oriented horizontally in the sky, and the width and appearance of a sun pillar is based entirely on how these ice crystals are positioned. What Does A Sun Halo Mean? When the sun halo I saw occurred, some people remarked in the comments section of local news websites that they thought it signaled the end of the world… I do hope that was only a streak of sarcasm on the readers’ parts! As a matter of fact, a sun halo (and moon halo) usually means that rain will occur within 24 hours, because the cirrostratus clouds that cause these beautiful halos usually mean a front is near. And, indeed, we were on the cold side of an advancing warm front when the sun halo appeared over my head. So, sun halos can be a great visual diagnostic tool for forecasting weather!